As an independently owned ParkerStore operator and premier distributor of quality Parker parts, Hose & Fittings, Etc. has been providing solutions for hydraulic and pneumatic challenges since 1978. Whether you need a hose assembly while you wait or emergency service, we can help. Hose & Fittings, Etc. provides you with quality service by Parker certified experts who will get you up and running fast. What are ParkerStores? ParkerStores are our local retail stores packed with Parker parts. All parts are out in the open so you can find what you need fast. Our knowledgeable staff can fabricate replacement hose assemblies on the spot, or bend a new metal tube assembly in a day. 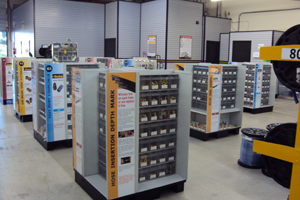 With 5 convenient ParkerStore locations throughout California and Nevada, we stock thousands of hydraulic and pneumatic parts. We have additional access to even more parts from Parker warehouses nationwide, so we can get your part when you need it. Visit any one of our 5 ParkerStore locations today. Parker Tracking System is an innovative solution which helps increase the speed and accuracy of sourcing and procuring replacement hose assemblies. The PTS tag, with its unique code, links each hose assembly to a database where all information necessary to replicate the hose assembly is stored. Participating Parker distributors (worldwide) can access this information and use it to fabricate a new hose assembly. No need to measure and identify components of the old hose assembly. No need to take the old hose assembly off your equipment before the replacement arrives. Hose & Fittings, Etc. 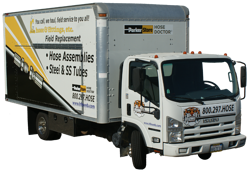 offers a Mobile Hose Repair Service through its ParkerStore in Fresno, CA. Research shows that in the event of unexpected equipment down-time, one of the most time consuming tasks is locating replacement parts. 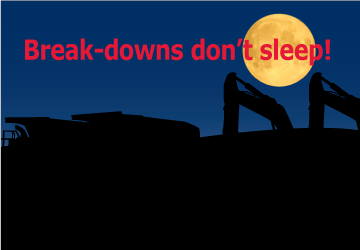 Sign up to take advantage of our 24/7 Emergency Service - providing you with access to hydraulic and pneumatic parts anytime - day or night. Located in Sacramento, CA, our Hose Assembly Production Facility has the cutting-edge machinery and skilled technicians to fulfill your large hose assembly order quickly. At this facility your hose assemblies can be fabricated, labeled with part numbers and, if required, put to into kit form. Our state-of-the-art Tube Assembly Production Facility, also located in Sacramento, CA, provides our customers with a source for custom fabricated tube assemblies and hose/tube combos. 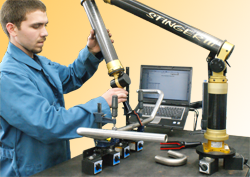 Utilizing state-of-the-art CNC bending machines, operated by the best technicians in the industry, we can fulfill any custom tube assembly order. Take advantage of our expertise, and experience working with product development teams. We know our products and how they can be utilized which makes us perfect partners during any prototyping project involving hydraulic or pneumatic products. Our VMI Service (Bin Stocking Service) will help you control operating costs while better maintaining your inventory. From labeling systems to automatic ordering, we will make sure that you have the part in stock when you need it. Hose & Fittings, Etc. will create a program to meet the inventory and supply chain demands of your high-volume shop. Hose & Fittings, Etc. offers personnel training tailored to your needs. Whether your technicians need to learn how to properly crimp a hose using Parker's crimping system, need to brush up on thread identification, or could benefit from safety training, Hose & Fittings, Etc. has a training program for you.